What can we do but play our part…Outlander fandom and the world – My Outlander Blog! As you probably know, the Outlander fandom has been caught up in a frenzy of voting. The fans seem to be of two minds about this subject. There are those who feel their efforts to vote awards for Sam, Cait, Tobias, etc. are efforts for Outlander as a whole. They feel the more attention they can help give the show the better. They hope that this attention will result in more viewers and therefore, an increased chance that the show will continue to be renewed. A worthy goal to be sure. There are others in the fandom that feel the pressure to vote borders on the ridiculous. They aren’t sure what any of this accomplishes or what the awards even mean. They feel like the fandom’s Twitter feeds and Facebook pages have been hijacked by pleas to vote Sam or Cait for the THIS award or the THAT award. I’m sure everyone can agree that there HAVE been a lot of voting campaigns in the last few months. I’m all for our actors and show getting the accolades they deserve, but I also believe there is enough diversity and room in the fandom to allow voters and non-voters to co-exist peacefully. However, today I was reminded again that the world we live in is pretty large and there really are bigger issues out there than our little obsession. 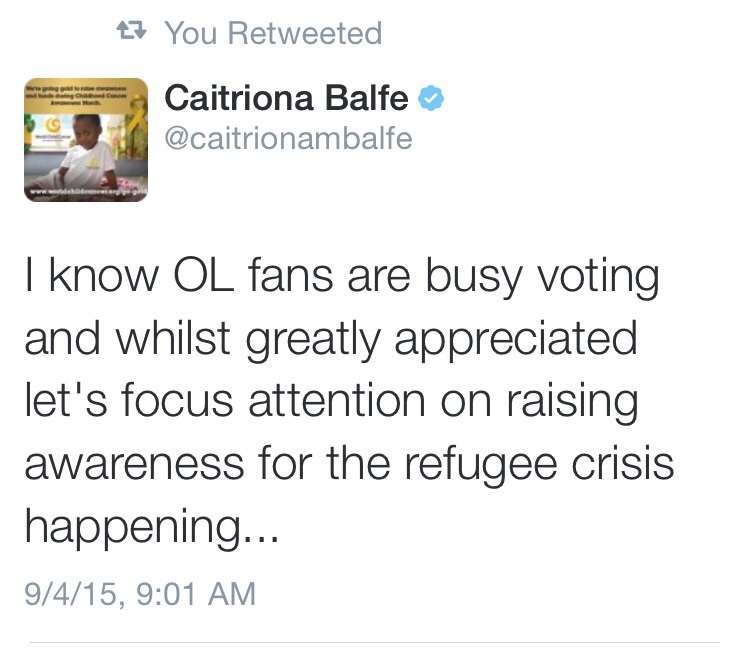 Caitriona Balfe, our Claire, tweeted a plea of her own today. While graciously thanking everyone for their votes, she asked that we might turn our attention, energy and efforts toward the plight of the Syrian refugee crisis. She has experienced our generosity with Childhood Cancer charities and she has seen what we can when do when challenged. Although bringing attention to Outlander IS a worthy goal, we have a chance to make a real difference in the world. When I saw this tweet from Cait, I thought it was something Claire would do. She tried to gently turn our collected efforts toward helping people who need our help. Like Claire, we see people in need and we have a chance to help heal. I’m totally confident that in the time between Cait’s tweet and my writing this, the fandom has been hard at work creating a plan and encouraging the “fanmily” to action. I’m sure not everyone will participate and that’s okay. Not everyone has the same amount of time or resources. However, I would still urge everyone to take a look at the world around them. We all can make a difference in our own little neck of the woods. Kindness, thoughtfulness, and encouragement cost little, but mean much. Like Jamie and Claire, we can try to effect history by turning the tide of events and do more than just “play our parts”. I am one who has been voting. But C’s tw struck me: better to donate in her name. While I totally agree with the sentiment of this post, I must point out that refugees from Syria are not Serbians….rather Syrians. Accuracy goes a long way! So sorry will fix ! Fixed! Thank you! I try to catch my typos a gaffes but don’t always succeed. That one made me sad. You are human and we all make mistakes; on balance which is worse-hightlight the plight or worry about a typo? Beth, as always, your posts are very thoughtful. It is a credit to the actors that they encourage fans to also focus energies on their fellow man. I salute them. Thank you for posting this Beth. It is a credit to Cait to bring this to everyone’s attention, this crsis has gone on for years. 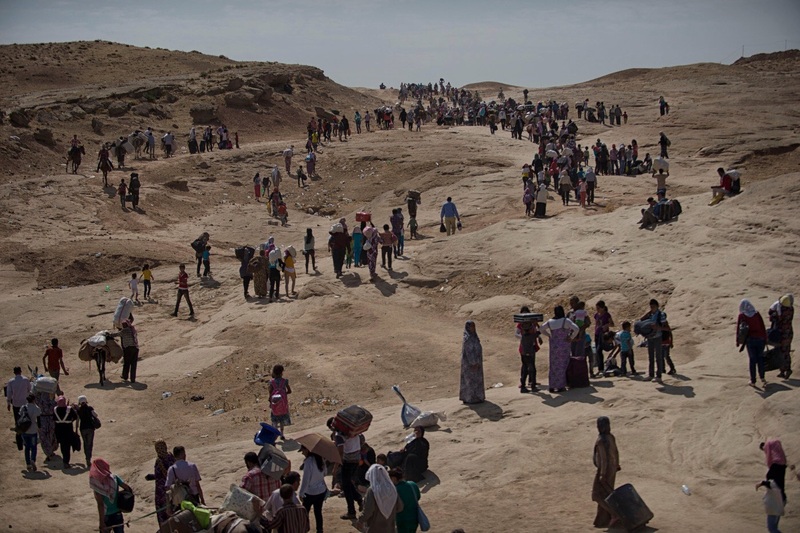 Not only are the refugees Syrian, they also come from Iraq, Afghanistan and other regions threatened by ISIS and others. Beth, thanks for bringing this to our attention and activating the power of the fandom for such a worthy cause. And good job, Cait. Thanks for this. I had been thinking along these lines as well…focussing to much energy on small things…and was so glad to see Cait’s tweet. Not that we need feel guilty about enjoying Outlander, but there are indeed bigger things. She seems to have a wonderful heart. Yep…I agree and laughed at that youtube. It is nice Autumn weather and enjoying the Great Outdoors does one a world of good!!!! And having a bigger picture of what is happening in our world is good for us as humanity and for our whole planet. Thank you for raising this subject. As one who has rallied the troops in voting many times, including the recent Radio Times award, I have tried many times to make my position clear on this. I love this show and EVERYONE who works on it – it’s a tremendous piece of work, and as a fan based in the UK, I am keen for as many of my countrymen to see it as possible. That’s why I backed the Radio Times poll. Had it been Cait up for the RT award, then it would have been her I was supporting instead. Sam and Cait ARE the show for me. I apologise to anyone I’ve upset by not supporting the E!Online poll. It’s not that I think Cait doesn’t deserve it; she does, but there are so many polls out there, and I see so many fans with voting fatigue, that I personally believe we should be more selective in what we utilise our considerable voting efforts for. Not everyone will agree, I’m sure, and I would no more force my will on them, than expect them to force their’s on me. I would urge fans however, to consider following Cait’s example, by utilising some of that amazing fandom power and compassion to tackle some very real problems in this world. It’s easy to feel like a voice in the wilderness at times; powerless to make any significant change, but I think social media is an opportunity to turn that on its head. It’s time we stopped waiting for Governments to do things and got off our collective arses and show ’em how it’s done! However you choose to spend your time; voting or otherwise, I hope as a fandom we will always respect each other’s right to choose. I’m proud to belong to Clan Outlander. Thanks for sharing. I think we agree! Proud to be a fan in this passionate group! Can’t wait to see how they respond to this opportunity to help! I just know they’ll do the right thing! I’ll read it! And thank you!